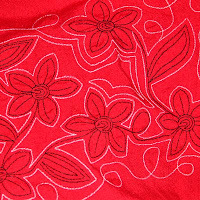 Whether you are a free motion doodler or a digitizing embroidery scribbler, both methods can produce great results for infinity scarves and border embellishing! 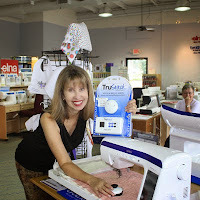 Using a tablet and pen adds to creative freedom in embroidery software but not crucial, if you know how to use the right tools in your software. If using a tablet, there will be a "smoothing" line feature available in the software that accompanies it. Or in the Bernina, you can do it from within that software. Last week at the embroidery conference, my students learned how to create the design used in the scarf for the hands on class.The simplicity of a motif with an added bean stitch provides the back drop needed for any repetitive design. 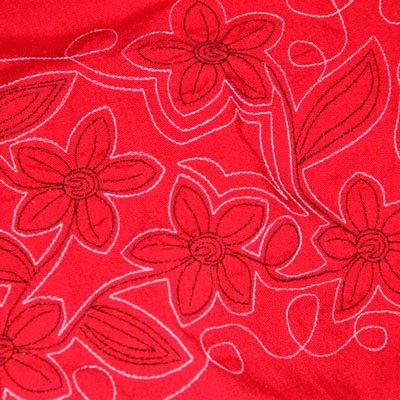 If you apply a double stitch then the design will begin and end at the same point. Using a bean stitch allows a heavier line that begins and ends at opposite ends. That is the key for easy repetitive stitching and multiple hooping. In the class, it was demonstrated with Bernina and Brother made software with a reference to Art and Stitch. Let's explore Art and Stitch. By using the built in drawing tools, you first have the ability to perfect your artwork. Keep in mind that this is doodling so perfection really is in the eye of the beholder. July 4th brings to mind stars and a casual feel. First choose the hoop size! The freehand, straight, curve, bezier and arc tools are easy to use and references on them are kept on the Art and Stitch website with clear details in the well written manual. This quick sketch was drawn using the straight and curve tools to provide practice with switching between them and editing. The key to Art N Stitch is to perfect your drawing first and then applying stitches. The same holds true for many software bundles on the market and it's an excellent habit to adopt. You will see the difference between this initial drawing (start and finish) and the final one with stitches applied. The beginning and ending area points have been reshaped curves to make them blend better for continuous stitching on a scarf. Play with your points and lines until you are satisfied. Use the running stitch tool to apply stitches. For this type of repetitive design, choose the bean stitch as a suggestion. Under Type there is a drop down menu. For my own design, I lengthened it to 2.5. Apply stitches and you can still reshape, if needed. Note the difference between the original and the final. The next step will be to test out our pattern by stitching. Looks plain right now... but wait! Next post: stitching out our sample and creating templates!